The agreement establishes the continuation of a TU Delft office in Latin America and facilitates the joint activities. These include a Dual Degree PhD program, advanced courses and online education, joint research projects and exchanges. “It is good to see how the bottom up initiatives have grown to such an impactful collaboration” says Marcelo Knobel, “now it is time to fully embed this in our prime administrative processes”. The TU Delft office was first opened in 2011 by the King of The Netherlands. In the following years the collaboration was developed together with BE-Basic (Public Private Partnership) in the field of biobased economy. This resulted in a series of 15 advanced courses, a Massive Open Online Course (MOOC), over 15 joint research projects and 14 Dual Degree PhD projects. The overall joint input exceeded 17 M Euro’s. “Now it is time to expand our focus. TU Delft has 100 staff members who collaborate with Brazil in different fields of expertise” says Patricia Osseweijer. “We have aligned this to large programs with global impact and industrial interest. UNICAMP has a lot to offer both in expertise and context - relevant research. The collaboration aims to deliver increasing numbers of excellent graduates on top of solutions for global challenges”. The programs are amongst others supported by research organisations such as NWO and Fapesp. 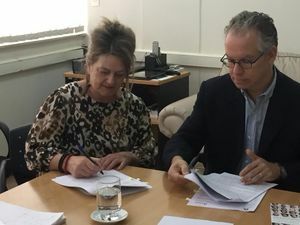 In 2017 the President of TU Delft, Professor Tim van der Hagen led a visit with several Deans and group leaders to Brazil where he signed a Memorandum of Understanding with Marcelo Knobel with the aim to further establish the collaboration and extend it to other fields of joint interest. Professor Patricia Osseweijer was appointed as University Ambassador Brazil. In line with the new Global Engagement Framework of TU Delft a Brazil plan was developed which focusses around the themes of Energy, Water, Aviation and Smart Infrastructure & Mobility. Each theme is led by two professors.